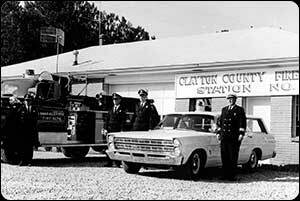 The Clayton County Fire Department was established on March 1, 1967. Emergency medical service was established by unanimous decision of the Board of Commissioners, December 1971, and assigned to the direction of the Fire Chief. In 1966 there were six separate fire departments operating within Clayton County, Georgia. Those departments protected only 23% of the County, leaving a staggering 77% of the County unprotected from the threat of fire. There was an apparent problem in that the people who lived and worked in the unprotected areas thought they had fire protection. The Clayton County Area Safety Council formed and in endeavoring to promote safety appointed then Assistant Chief William J. Guice of the Forest Park Fire Department as Chairman of the Fire Safety Committee. Serving as the Chairman of the Clayton County “Fire Safety Committee”, Guice wrote, “Our present problem is bad but what about the future?” In October of 1966, the citizens of Clayton County voted 10 to 1 to establish fire districts and provide fire protection within the unincorporated areas. On March 1, 1967, the Clayton County Fire Department was officially established with the appointment of William J. Guice as Fire Chief. On that same day, the first four 1,000 gpm fire trucks were ordered. The department began operations with a budget of $143,000 dollars. The Departments’ communication was handled through the Clayton County Police Department using the Clayton County Water Authority radio frequency. During the next eight weeks the Department grew to ten members with eight of those men divided between two shifts which worked 24 hours on duty and 24 hours off duty under the supervision of Chief Guice and newly appointed Assistant Chief Clifford J. Wiggins. Chief Wiggins was in charge of operations and personnel. Those firefighters brought home $390 dollars a month and had an extra day off each month which was called a Kelly day. One of the first Clayton County Fire Department fire reports was dated March 3, 1967. The alarm was received by Bob Wilstead at 1430 hours to a brush fire along side of the railroad tracks at the Ellenwood crossing. 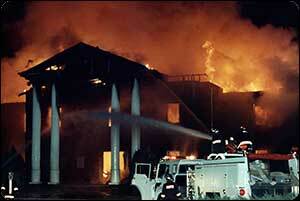 Unit 131 was listed as the apparatus at the scene and the probable cause was listed as a set fire. By the end of 1967, the newly formed Clayton County Fire Department had answered 297 fire calls, 74 medical emergencies, 37 miscellaneous calls for a total of 408 calls. The estimated fire damage loss for the year was $51,120 dollars. On October 8, 1969, the anniversary of the “Great Chicago Fire”, the Clayton County Fire Department added the Fire Prevention Bureau to better combat the fire threat. 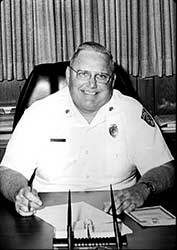 In January of 1970 Ed R. Cooper was chosen as the Fire Marshal and held the rank of Deputy Chief. This new Division of the Fire Department offered services such as fire safety inspections, educational talks, and fire cause investigations. Clayton County was evolving from a rural Georgia community into a metropolitan suburb of Atlanta. The population, housing, jobs, and businesses were all changing. The growth of the County compelled the Department to grow even faster in its infancy, the growth included new fire stations, more personnel, more equipment and specialized equipment. The Department grew rapidly to five fire stations, 61 firefighters, and 14 apparatus by 1970. This growth resulted in the ISO rating dropping from a 10 to a 7. In 1973 the Clayton County Fire Department answered calls to 1,266 fires, 1,066 rescue calls, and 852 miscellaneous calls for a total of 3, 184 calls responded to. The fire damage loss for that year totaled $1,151, 483 dollars. The Department implemented the Emergency Medical Service(EMS) pilot program under the supervision of Captain Ryman L. Fair to meet changing needs of the community. Through the training program our personnel were some of the first emergency medical technicians and advanced emergency medical technicians certified in the State of Georgia. This program evolved into the present EMS Division. In 1977 the Department expanded our EMS services to include transporting the injured to the hospital. The Emergency Medical Service Division provides medical treatment and transport for the sick and injured, medical training for our EMTs, and provides supplies needed for EMS units. 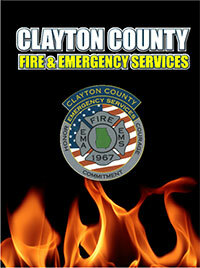 This Division of the Clayton County Fire Department was officially established in December of 1974 with three EMS vehicles and one reserve vehicle. In January of 1975 the Training Division was formed with Ryman Fair chosen as the Officer in charge. The Training Division provides inter-department training through rookie school, in-service training, and classroom instruction. The training division is also responsible for tracking and submission of training records with the Georgia Firefighter Standards and Training Council and the Georgia Fire Academy.